2005-03-21 Application filed by Shell Internationale Research Maatschappij B.V. filed Critical Shell Internationale Research Maatschappij B.V. This invention relates to a process for the production of olefins, alcohols, ethers, ethoxylates, glycols, and olefin oxides from alkanes in a halogen, preferably bromine or chlorine, system, wherein there are halogenation (reaction of halogen with the alkanes), oxidation (reaction of alkyl halide with a metal oxide), optional neutralization (reaction of hydrogen halide and metal oxide), and regeneration (reaction of metal halide with air, oxygen, or other oxygen gas containing mixtures) reactions which take place in the process and wherein at least one of the reactions wherein water and halogen and/or hydrogen halide are present is carried out in reactors made from metallurgy including zirconium and/or zirconium-based alloys that contain varying amounts of alloying elements such as tin, niobium, chromium, iron, oxygen, and nickel. Preferably, this same metallurgy is used in the fabrication of separation and purification equipment for the process. Short term corrosion testing was performed in an attempt to find acceptable materials for this process environment. These corrosion tests were conducted in four cells containing water that was saturated with bromine. Each of the cells were constantly stirred and maintained at a high enough pressure to ensure the water remained in the liquid state. The tests were run at two temperatures, 150°C and 188°C. These tests simulated water condensation at those high temperatures. Oxygen may have a very dramatic effect on the corrosion rates of many metals. Since various areas of the proposed process will have varying contents of oxygen, one set of tests was initially purged of oxygen by displacement with nitrogen gas, while the second set allowed for the presence of oxygen contamination. The tests were originally scheduled to run for 10 days. The thermocouples used to control the temperature of one of the test cells failed due to corrosion after only three days of operation. This forced the immediate shut down of this test cell. Upon inspection of the coupons that were retrieved from this cell it was determined that the integrity of the remaining test cells, which were constructed of Hastelloy C276, might have been compromised if the testing were to continue for the entire 10 day duration. Due to this concern the tests in the three remaining cells were subsequently terminated. Although the test duration was abbreviated, the corrosion data reveals a significant advantage in the corrosion resistance of Zirconium 702 in comparison to the more commonly used nickel and chrome alloys. 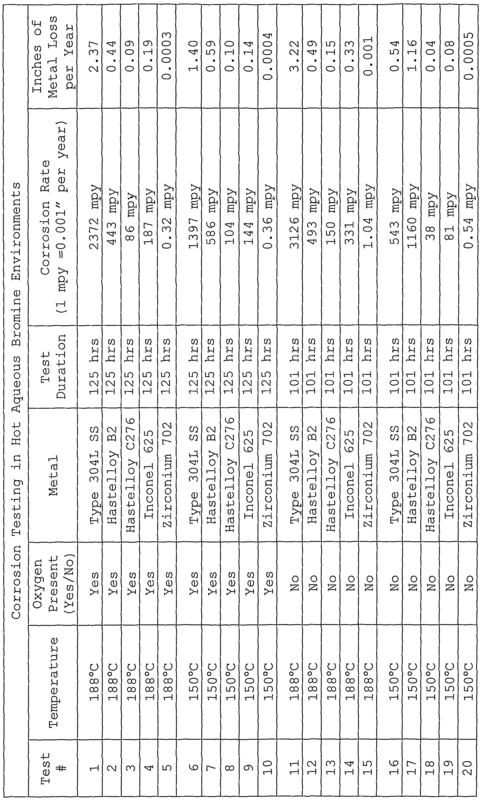 The data from these tests are provided in the table below. It should be noted that although this testing targeted a hot bromine/water environment, similar trends in data are expected for the analogous chlorine based environment. 1. A process for the production of olefins, alcohols, ethers, ethoxylates, glycols, and olefin oxides from alkanes in a halogen, preferably bromine or chlorine, system, wherein there are halogenation, oxidation, optional neutralization, and regeneration reactions which take place in the process and wherein at least one of the reactions wherein water and halogen and/or hydrogen halide are present, preferably at least the oxidation, neutralization, and regeneration reactions, most preferably any step in the process wherein water and halogen and/or hydrogen halide are present, is carried out in equipment made from metallurgy including zirconium and/or zirconium-based alloys. 2. The process of claim 1 comprising the steps of: a) halogenating an alkane to produce a mixture of alkyl halides, unreacted alkanes, and hydrogen halide; b) oxidizing the alkyl halide, optionally together with the hydrogen halide, with a metal oxide to produce the reaction products and metal halide, wherein the hydrogen halide is optionally separated; c) if the hydrogen halide is separated in step b) , optionally neutralizing it with a metal oxide to produce a metal halide; d) regenerating the metal halide (s) from the oxidation and neutralization steps b) and c) to metal oxide and halogen using oxygen, air, or a gas mixture containing oxygen gas such that the halogen and metal oxide may be recycled for use in the process; and e) separating the reaction products from the reaction mixture of b) and then purifying the reaction products. 3. The process of claims 1 or 2 wherein the zirconium-based alloys may contain varying amounts, preferably from 0.01 to 3% by weight of the total weight of the alloy, of alloying elements such as tin, niobium, chromium, iron, oxygen, and nickel. 4. The process of claims 1 to 3 wherein the metal halides produced in the oxidation and neutralization reactions are different and they are regenerated independently. 5. The process of claim 1 wherein alkanes are converted to alpha olefins of the same carbon number. 6. The process of claim 5 comprising the steps of: a) halogenating linear alkanes, branched alkanes, or a mixture of linear and branched alkanes to produce a mixture of primary mono-haloalkanes, internal mono-haloalkanes, unreacted alkanes, hydrogen halide, and possibly multi-haloalkanes; b) separating the primary mono-haloalkanes from the mixture of step a) by distillation or other appropriate separation step(s); c) optionally separating the hydrogen halide produced in the halogenation step a) and optionally neutralizing it with a metal oxide or mixture of metal oxides to produce a partially halogenated metal oxide and/or metal halide or mixture of partially halogenated metal oxides and/or metal halides which may then be converted for recycle to halogen and metal oxide or mixture of metal oxides using air, oxygen, or gas mixtures containing oxygen gas; d) oxidizing the separated primary mono-haloalkane with a metal oxide or combination of metal oxides to convert the aforesaid primary mono-haloalkane to a mixture of products that contains alpha olefins, unconverted primary mono- haloalkanes, and possibly other reaction products, and a partially halogenated metal oxide and/or metal halide or a mixture of partially halogenated metal oxides and/or metal halides; e) separating and regenerating the partially halogenated metal oxide and/or metal halide or mixture of partially halogenated metal oxides and/or metal halides from step d) to a metal oxide or mixture of metal oxides and molecular halogen, preferably Br2 or Cl2, by reaction with air, oxygen, or gas mixtures containing oxygen gas wherein the halogen produced and/or the metal oxide may be recycled; and f) removing the unreacted primary mono-haloalkane from the reaction mixture and then purifying the alpha olefin; wherein at least steps c) , d) , and e) are carried out in equipment which is made from metallurgy which includes zirconium and/or zirconium based alloys. 7. The process of claims 5 or 6 wherein the zirconium-based alloys may contain varying amounts, preferably from 0.01 to 3% by weight of the total weight of the alloy, of alloying elements such as tin, niobium, chromium, iron, oxygen, and nickel . 8. The process of claims 5 to 7 wherein the metal halides produced in the oxidation and neutralization reactions are different and they are regenerated independently. 9. The process of claim 1 wherein alkanes are converted to primary alcohols of the same carbon number. 10. The process of claim 9 comprising the steps of: a) halogenating a linear alkane, branched alkane, or mixture of linear and branched alkanes to produce a mixture of primary mono-haloalkanes, internal mono-haloalkanes, unreacted alkanes, hydrogen halide, and possibly multi-haloalkanes; b) separating the primary mono-haloalkanes from the mixture of step a) by distillation or other appropriate separation step(s); c) optionally separating the hydrogen halide produced in the halogenation step a) and optionally neutralizing it with a metal oxide or mixture of metal oxides to produce a partially halogenated metal oxide and/or metal halide or mixture of partially halogenated metal oxides and/or metal halides which may then be converted for recycle to halogen and metal oxide or mixture of metal oxides using air, oxygen, or gas mixtures containing oxygen gas; d) oxidizing the separated primary mono-haloalkane with a metal oxide or combination of metal oxides and water to convert the aforesaid primary mono-haloalkane to a mixture of products that contains primary alcohols, unconverted primary mono-haloalkanes, and possibly other reaction products, and a partially halogenated metal oxide and/or metal halide or a mixture of partially halogenated metal oxides and/or metal halides; e) separating and regenerating the partially halogenated metal oxide and /or metal halide or a mixture of partially halogenated metal oxides and /or metal halides to a metal oxide or mixture of metal oxides and molecular halogen, preferably Br2 or Cl2, by reaction with air, oxygen or gas mixtures containing oxygen gas, wherein the halogen produced and/or the metal oxide may be recycled; and f) removing the unreacted primary mono-haloalkane from the reaction mixture and then purifying the primary alcohol; wherein at least steps c) , d and e) are carried out in equipment which is made from metallurgy which includes zirconium and/or zirconium based alloys. 11. The process of claim 10 wherein the zirconium-based alloys may contain varying amounts, preferably from 0.01 to 3% by weight of the total weight of the alloy, of alloying elements such as tin, niobium, chromium, iron, oxygen, and nickel.